Sadly, summer is coming to a close. I want to celebrate my last few days of freedom (before starting my final semester of college) by posting some summery foods. Nothing says summer like watermelon, so we’re kicking things off with a refreshing watermelon smoothie. Tea Dó is a really interesting place. It is basically an Asian appetizer and drink bar. 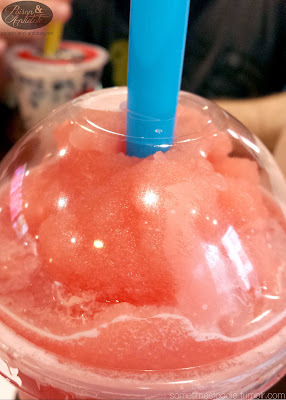 You can order hot teas by the pot, smoothies, onigiri, takoyaki, and various forms of bubble tea. Plus there are TV’s and boardgames available for customers to enjoy. A couple behind us were playing Jenga. My boyfriend and I stopped by for drinks, but I really want to go back and try all the appetizers. Why? Because it tasted like actual watermelon. No artificial flavoring at all. Sometimes the smoothies I get at bubble tea shops are syrupy sweet, and all that sugar just makes you even thirstier, but this was perfect. Plus the smoothie was HUGE. It lasted the rest of our walk and I still had plenty of smoothie left for the train ride home. If you like your drinks really sweet you can add some strawberry, lychee, or passion fruit popping boba to your smoothie. Personally, I enjoyed the super authentic fruity flavor. 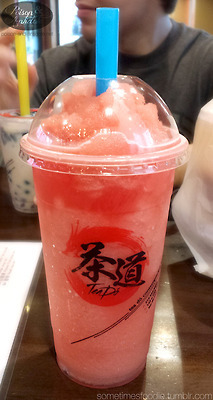 I will definitely be going back to Tea Dó before classes start in September.